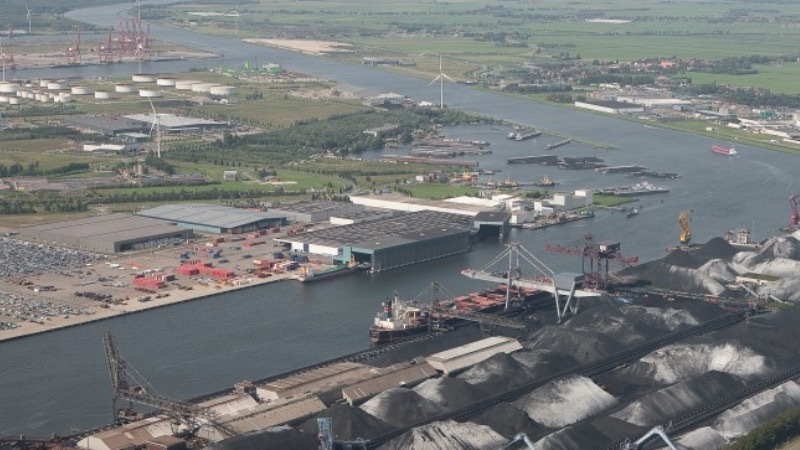 Terminal operator OBA (Overslag Bedrijf Amsterdam) will be clearing part of its coal-handling site this year in order to further diversify into other dry-bulk commodities. Its decision is prompted by the reduced demand for coal storage. This represents a key new step for Port of Amsterdam in its push towards sustainability, while the change is part of OBA’s strategy of becoming a multi- purpose terminal. OBA and Port of Amsterdam have expressed their joint intention to help advance the energy transition and have signed a Letter of Intent (LOI) to formalize this objective. In signing the LOI, the two partners agreed for OBA to clear more than 20% of its site to accommodate new operations, starting in the first quarter of 2018. The site to be released — roughly the size of 28 football pitches — concerns the non- automated section of these industrial premises which will lead to more efficient business for OBA. Investments in the site will focus on creating covered storage capacity. OBA Managing Director Harm Winkeler: “As a logistics services provider for various dry-bulk commodities, we are meeting the changing market demand, prompted in part by the energy transition. As Europe’s fourth-largest port, Port of Amsterdam is very well positioned in the supply chain for various major industries in the Netherlands and Germany. We aim to provide high-quality services and it’s vital that we adapt to our customers’ changing needs. (Western Port Area), OBA serves customers from a variety of sectors and industries, including the energy and steel sectors and the animal feed industry. OBA currently employs a passionate team of 120 employees who collectively are responsible for the annual storage and transshipment of around 19 million tonnes of dry-bulk goods. The main items processed include agricultural products, minerals, coal and circular products such as scrap and soil. Port of Amsterdam is Western Europe’s fourth largest port and plays a major role in the transshipment and processing of energy products. The North Sea Canal Area transshipped approximately 100mt (million tonnes) of goods in 2017, with Port of Amsterdam accounting for approximately 81mt of this amount. A total of 69,779 people work in the port region either at companies in the port or at port-related companies. Approximately 32,461 of these people work in Amsterdam. Port of Amsterdam is committed to being a smart port and to adding value for customers and the environment in a sustainable and innovative manner. It seeks to promote growth at companies, while still taking a careful approach to the available space and the quality of water, soil and air. As 'Port of Partnerships', Port of Amsterdam works intensively with partners in the business community, city and region.